Kyle’s. brought this to my attention on our Facebook FanPage. 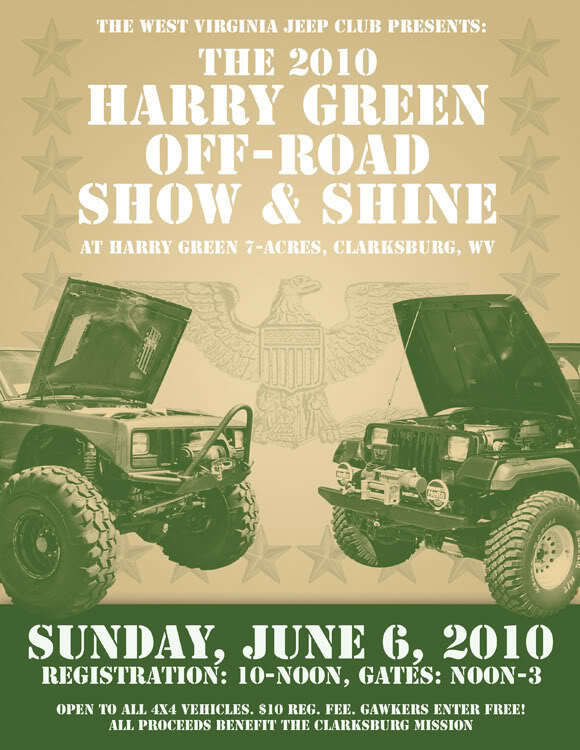 The West Virginia Jeep Club (jeepinwv.com) is having their annual Off Road Show and Shine June 6th, 2010. Kyle stated that “nearly 250 Jeeps were present at this event in 2009, but this year, for the first time, it’s open to ALL 4×4 vehicles. Vendors will be on display, the RTI ramp will be open for scoring, and the rock garden gets tougher every year. Trophies are awarded for best of show, best classic, most trail damage, etc. Always a good time!” Registration is from 10:00 am to noon. There is a $10.00 registration fee for entries but free for all to come and view. All proceeds benefit the Clarksburg Mission. If you are in this area, mark your calendar for this Jeep event! “JeepinWV.com is a website for off-road enthusiasts in and around West Virginia. It also serves as the internet home of the West Virginia Jeep Club, Inc, a not-for-profit organization formed to safely promote and protect the sport of off-highway driving in the mountain state. Although Jeep is in our name, our forum members and club members own everything from Samurais to Xterras. Our common thread is a desire to enjoy family-friendly four wheeling in a manner that is not destructive to our environment.” If you are in this area you may want to check Jeepin WV Jeep Club out for more upcoming events.